In an update to its online storefronts on Monday, Apple is now quoting iPhone 5s wait times at one to two weeks, shaving a few days off its previous estimates as the company's supply chain continues ramp up. As noted by MacRumors, every country with an Online Apple Store is showing the same "1-2 weeks" availability for the popular iPhone 5s, which quickly saw demand outstrip supply just hours after launching in September. two to three weeks, though some models were still hard to come by. 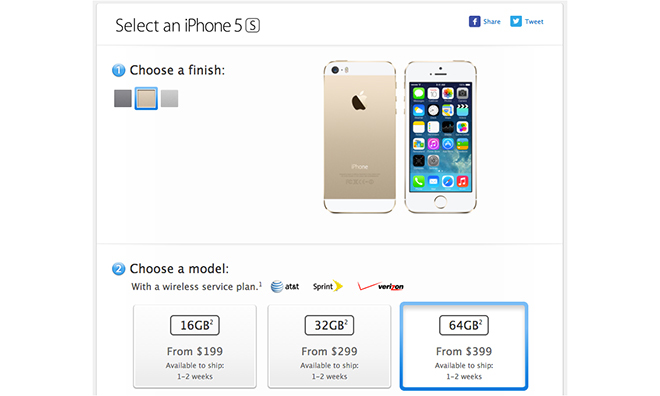 While the iPhone 5s is apparently selling well, the lower-priced iPhone 5c is purportedly not seeing the same amount of success. According to a pair of reports published last week, Apple has cut orders of the device from supplier Pegatron. It is unclear if the rumors are correct, however, as a contradictory report said Apple was actually adding suppliers for the plastic-backed iPhone. Combined, Apple sold a record-breaking nine million iPhone 5s and 5c units in the devices' first three days on sale. The Sept. 20 launch was the first time Apple debuted two new handsets in the same refresh cycle.